Fibre is the backbone of plant foods such as wholegrains, vegetables and fruits. It’s a type of carbohydrate that remains undigested in your gut and goes “straight through”, brushing your gut clean and keeping your digestive system healthy. Most of us only think about eating extra fibre when we get constipated, but actually fibre has powerful disease-fighting properties. Recent research shows that many Australians are not aware of this, and are not eating anywhere near enough. Fibre is essential for good health because it keeps you regular but it also feeds your “good gut bugs” which boost your immunity, cuts your appetite, improves your blood sugar control and lowers cholesterol levels. Not only that, fibre can help you keep a healthy waistline and dramatically lower your risk of getting chronic conditions like diabetes, heart disease and some cancers. In fact, a study has shown that for every 10g a day of total dietary fibre you consume, you cut your risk of bowel cancer by 10 per cent. And another study showed that regularly eating cereal fibres (like wholegrain breakfast cereals, rices and breads) can reduce your risk of dying from heart disease by almost 20 per cent! But don't forget that as you eat more fibre, you need to drink more water too, otherwise you could become constipated. The National Health and Medical Research Council (NHMRC) recommends that men eat 30g of fibre a day to stay healthy, and women 25g. If you’re at risk of chronic conditions such as diabetes or heart disease, it’s best to try to eat even more. The NHMRC recommends you aim for 28g (women) to 38g (men) daily to reduce your chronic disease risk. The 2014 Australian Health Survey shows that adults aged over 19 are consuming just 24.8g (men) and 21.1g (women) of fibre per day. For New Zealand, the average fibre intake for adults is 20g per day. These intakes are well below the levels recommended to reduce chronic diseases like heart disease and diabetes. Fibre is found mostly in wholefoods, or plant foods that have had little or no processing. Include a variety of these in your meals and snacks every day. Wholegrains and cereals eg traditional rolled oats, brown grainy breads, brown rice, barley, quinoa and wholegrain cereal biscuits. Aim for at least 3 serves a day. Legumes or beans eg lentils, red kidney beans, chickpeas or black beans. Use in 3 or more meals each week. Vegetables eg sweet potato, tomato, beetroot, corn, celery, broccoli and leafy greens. Aim for 5 different vegetables each day and keep the skin on where possible. Fruits eg apples, oranges, stone fruit, kiwi, pomegranate, berries and bananas. Snack on 2 pieces of fresh fruit daily. Nuts and seeds eg cashews, almonds, hazelnuts, brazil nuts, sunflower seeds, pumpkin seeds, chia seeds, or natural nut butters and spreads. Aim for ¼ cup of nuts and seeds each day. aim for three or more vegetable and legume-based meals each week. Source: NUTTAB 2010, Food Standards Australia and New Zealand. 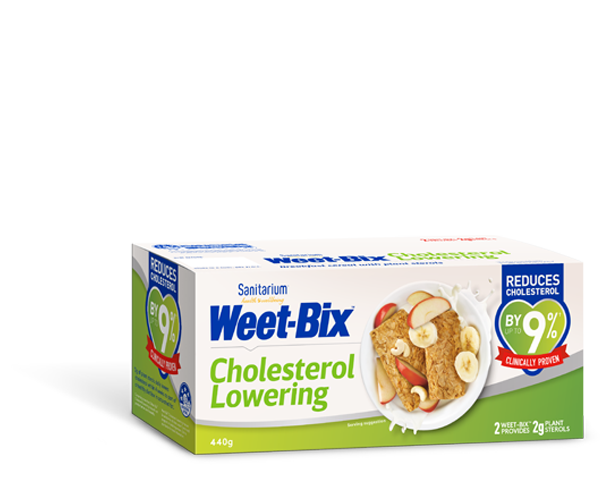 Have a look at Sanitarium’s Focus on Fibre report, by dietitian Shane Landon, if you're interested in more information about fibre. Yang Y, Zhao LG, Wu QJ, et al. Association between dietary fibre and lower risk of all-cause mortality: a meta-analysis of cohort studies. Am J Epidemiol 2015;181(2):83-91. Hajishaflee M, Saneei Pe, et al. Cereal fibre intake and risk of mortality from all causes, CVD, cancer and inflammatory diseases: a systematic review and meta-analysis of prospective cohort studies. Brit J Nutr 2016;116(2):343-352. Breakfast - kickstart your day!